Those who keep a firm eye on the weather were rewarded in Malaysia today, as qualifying played out in dry conditions to start with, and rain following swiftly along. Intermediate tyres decided the top ten grid, and it was Sebastian Vettel who showed the pace. There were other surprises along the way, however, from Ferrari, McLaren, Lotus and more. Read on for a full breakdown of how each session played out, plus graphs, charts, and immediate thoughts from the top three drivers. Hello! We're back again, time for qualifying for the Malaysian Grand Prix! We are, what, six days from the first race of the year, and there's no more time for pondering what we saw in Australia. F1 is in the humid conditions of Malaysia, with a grid order to decide! Naturally, everyone is weather watch again, as the Malaysia downpours occur on a very regular basis. We're expecting teams to have to use the wet tyres, but in terms of dry compounds available, it's hard and mediums - that means orange! Tweet from @WilliamsF1Team: 35 mins to go &weather reports show a high chance of rain early on in quali - although as we know the weather changes very quickly here! All the information you need to know about the weekend is available here: https://sidepodcast.com/post/malaysia-2013-race-information Including DRS zones, session times and last year's results! Whilst we're talking about last year, for the record, pole position was a 1:36.219 set by Lewis Hamilton. Nico Hülkenberg, still fired up despite missing a race: "We're aiming to make the most out of our package. Hopefully that is good enough for a lot of point, but at this point it's impossible to know. We'd love to have big points and speak about big podiums but it makes no sense to promise things at this point. It's still early days in the season... we just need to keep our head down, perform well, get the set up right and make the most of our chances." Interview with Stefano Domenicali: "This morning we did some tests, to do some fine tuning, now we need to see how we are. The crucial thing of today is how many laps we put on the tyres... I believe there will be a lot of action tomorrow, so it's important to save what is needed up to the last lap of the race. 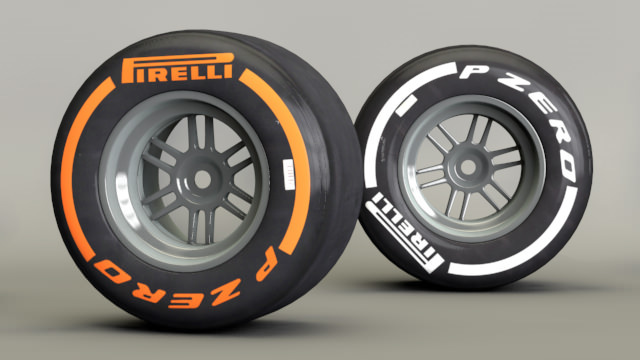 "I think the tyres are something, it doesn't help to say we are happy or not happy, it is what it is. We, as a team, need to learn how to use it, the drivers too, it's not easy, we can see that. That's what we need to be focused on today." In third practice, Sebastian Vettel was fastest, but the top eleven were split by less than a second. Twenty minutes start counting down on the clock and... no one is waiting at the end of the pit lane to hurry out. Bianchi is told over the radio he is going to do three timed laps, but that he's on his own in terms of finding space in traffic. I'd recommend now. Max Chilton breaks the silence and heads out on track. He's soon followed by others, Bianchi, Gutiérrez, two Williams and two Toro Rossos to name but a few. DRS this weekend is on both of the long straights either side of the hairpin. There are two distinct zones, one straight after the other. The two Marussia drivers set the first lap of the session, with 1:40s. Bottas immediately knocks two seconds off that. Nico Rosberg sets a more sensible time, jumping to P1 with a 1:37.2. All drivers have been out now except two Red Bulls and two Lotus chaps. Alonso and Massa head straight into the top five, joined by Hamilton, but none quicker than Rosberg yet. Jenson Button sets his first lap of the day, good enough for fourth. That's a high position for a McLaren these days! Hamilton gets some feedback over the radio on where to improve: sector three and turn nine, apparently. Adrian Sutil jumps to the top of the times with a 1:36.809. Not quite Vettel's 1:36.4 from FP3, but good pace! Webber peels out of the garage. The Lotus duo are on track, whilst Vettel deigns to join the fun at last. In shock radio news, Button has "too much oversteer." Grosjean, with the softer of the two compounds on, jumps up to fourth. Räikkönen can't beat Sutil's time, a 1:36.9, despite being on the same tyres. Something went awry with Mark Webber's lap so he's backed off his lap. Vettel crosses the line for 11th. The drop zone, then, features Ricciardo, Bianchi, Chilton, Pic, Van der Garde... and Webber. Webber hauls himself out, but only to 15th. Vettel is informed over the radio he needs to have another go. In Toro Rosso versus Williams news, Ricciardo and Maldonado are close on pace and out of the drop zone, Vergne and Bottas also close on pace, and not looking so good. 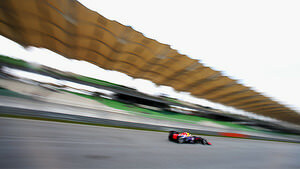 Webber improves to ninth, where is the Red Bull pace this session? Supreme lap from Jules Bianchi who remains 19th but is almost a second faster than the three drivers behind him. Jean-Éric Vergne fails to get through to the second session of qualifying, his Saturday form from last year continues! Pit to Jenson Button: "I know it doesn't look like it from here, but the radar says there is rain on the way." The fastest three from that session, Sutil, Räikkönen, Rosberg. Paul di Resta heads straight out for the second session. Sutil joins him, and Gutiérrez also joins the early runners. Nine drivers out on track, Di Resta starts his first flying lap of the session. Hamilton is instructed to work the rear brakes to get them up to temperature. Scrap that about Di Resta, he's abandoned the lap and returned to the pit lane. Rosberg and Hamilton set the benchmarks with 1:36.190 and 1:36.517 respectively. Sutil currently third. Hamilton reports it is raining at turns five and six. On board with Alonso shows the track a bit slippery around the final corner. He moves up to seventh. Massa takes sixth ahead of his teammate. Di Resta on a lap now, hoping to beat the rain. Di Resta goes flying off track into the gravel, he recovers it, but that's a lap ruined. Track surface slippery at turns 8, 9 and 18. Currently in the drop zone, Grosjean, Hülkenberg, Ricciardo, Gutiérrez, Di Resta, and Maldonado. Di Resta's second attempt at a lap and he properly spins off, the track not playing ball at all. Right under the grandstands, the crowd cheered. All the drivers are returning to the pitlane, they know there's no chance of improvement now. Several replays of the Force India spin show Di Resta going round and round at least twice, ending up the wrong way. Dizzy! Ted News: Maldonado abandoned his lap, so he didn't set a time in that session. Weird moments, as the drivers are all done, but there's a minute remaining. Interview with Paul di Resta: "We've got it wrong on the pit wall, we've tried to make a clever call, but we should have continued the lap we started at the beginning. I had to be a bit better to get through... we've obviously got a lot of work to do tomorrow, but we've got a good car... we've got four sets of fresh rubber, people surrounding us will have the same but we won't give up without a fight." The fastest three in that session were Rosberg, Webber and Hamilton. Interview with Romain Grosjean: "Strategy wasn't fantastic in Melbourne, we lost the radar with the image of the rain coming. Not much we could do, we should have played it a little bit more safe but it is what it is. The race is long, it can rain at any time, more tyres in my pocket, hopefully I can use them and use them well." The cars head out of the garages to line up at the end of the pitlane - Sutil heads up the pack. It's raining but the sun is out, there's a rainbow hanging over the circuit. It's intermediate tyres all round, as ten drivers hit the track immediately. Sutil crosses the line to start his flying lap, as a Red Bull slows up and moves out of the way trying to get some clear air. Some bits of the track look dry, others are still throwing up plumes of spray - difficult conditions for those tyres. The times start to pour in, Sutil is immediately beaten by Pérez, but Vettel leaps to P1 with a 1:52.576. On board cameras with Lewis Hamilton show zero visibility, at certain sections of the track. Webber and Button's first efforts were over 2 minutes each, but Webber improves to second now. Vettel orders another set of intermediates as he comes in for a stop. Button also manages to shave multiple seconds off his time, up to seventh for the McLaren driver now. Replays show Massa losing the back end at a damp corner, but he manages to keep control and carry on. Team radio to Räikkönen: It's definitely just one timed lap, you have to get it on one timed lap. Lewis Hamilton crosses the line half a second faster than anyone else, a 1:51.699, pushing Webber and Vettel down to second and third. All ten drivers out on track again, just one minute left to do their stuff. Räikkönen crosses the line for fourth, Alonso behind him scoops up P1 but Vettel is right behind him. It's Vettel, almost a second faster than everyone else - 1:49.674. Felipe Massa moves up to second place, out-qualifying Alonso yet again! Hamilton is still on a lap, but it wasn't a great lap and he remains fourth. Vettel sounds super happy to be on pole position for the 38th time in his career. Massa and Vettel sharing thoughts of the session, they look damp - either from heat or the rain! Lewis Hamilton hops up on the scales, he's kept his helmet on, may not be too happy with how that session worked out. A replay of Webber radio, when informed of his position, the Australian grumpily said: "Unbelievable." Interview with Stefano Domenicali: "You never know, in these conditions everything can be good or it could be worse. I think we made the right decision to change the tyres at the end, I'm happy for that. We don't score points today, it's fundamental tomorrow to understand the right way the race. "Since last year, when everyone was pushing me to do something different [with Massa], I'm happy for him, for the team, as always we think as a team, not as a person." Press Conference Quotes - Sebastian Vettel: "I think generally an interesting qualifying session. We knew rain was on the way, we expected some at the beginning of qualifying but it didn't come... Q2 was quite on edge, I would say. The rain helped us a little bit otherwise I think we would have had to go out again, it was just enough to go through to Q3. Obviously with the circuit drying, it was clear it was better to change tyres and we confirmed that pretty early. I think we did the right thing. Very tricky because you don't know if there's more rain coming or not. Bit surprised by the gap, I had a decent lap and was very happy. All in all a good session for us, we managed to save some tyres which could be crucial tomorrow." Press Conference Quotes - Felipe Massa: "I don't know if we'd be able to be 2nd and 3rd in the dry, there were other quick cars, Webber, Kimi, Mercedes as well. It was a good qualifying from us, we took the right decision to stop. We managed to put a good lap together as well. Maybe the rain helps a bit." Press Conference Quotes - Fernando Alonso: "Try to do a good race, try to score as many points as possible. We are not sure of the performance of the car on race pace. Every run we do is inconsistent, sometimes we are okay, sometimes we are not. We have no big problems on the long runs on Friday, in Melbourne race pace was okay, so there's no reason not to be optimistic." Press Conference Quotes - Sebastian Vettel: "If you start in the front, you always want to finish there as well. I think it will be a long race, difficult to know the true pace, but I think we confirmed more or less what we saw in Melbourne. I was happy with the balance of the car, considering where we were last year here, a big step forward. We find the right about of percentage, less than 100% to start the race. Tomorrow... we know the pace is there, hopefully we can get to the flag in the same position." Tweet from @clubforce: We are confident about the car's performance and we will try and bring home as many points as we can - tune in tomorrow for the race! Interview with Mark Webber: "We got out of the car what we could have done, on the laps when I was pushing. We didn't push when the track was at its quickest... I thought I had more time, more laps to play with. Frustrating, but that's the way it goes sometimes. We're fifth and can still race from there." Thus, the grid is set for tomorrow's race. Vettel takes another pole position, but he'll be hounded by not one, but two Ferraris when the lights go out. McLaren still struggling for pace a little bit, but eighth and tenth is at least in the right direction. The midfield may be an interesting fight too, as drivers make the most of any potential inclement conditions. Do stay tuned to https://sidepodcast.com and http://f1minute.com for all the news and views, and be back here tomorrow for some fabulous racing at Sepang!